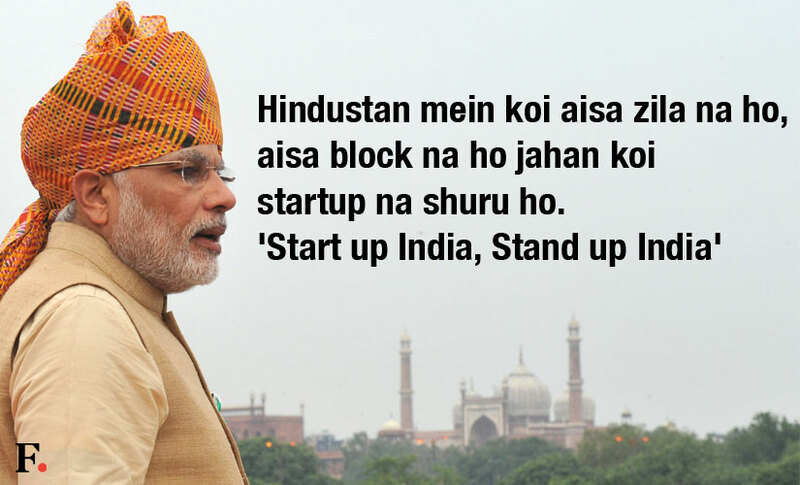 Home Economy New campaign by PM Narendra Modi "Start-up India, Stand up India"
New campaign by PM Narendra Modi "Start-up India, Stand up India"
The Prime Minister Narendra Modi on 15 August 2015 launched a new campaign Start-up India, Stand up India to promote bank financing for start-ups and offer incentives to boost entrepreneurship and job creation. The campaign was launched during the celebrations of 69th Independence Day at Red Fort, Delhi. The initiative is aimed at encouraging entrepreneurship among the youth of India. As per the initiative, each of the 1.25 lakh bank branches should encourage at least one Dalit or tribal entrepreneur and at least one woman entrepreneur. Under this initiative, in addition to existing systems to facilitate start-ups, loans would also be given to help people. This initiative will give a new dimension to entrepreneurship and will help set up a network of start-ups in the country. • Union Agriculture Ministry will now be renamed as Agriculture and Farmers’ Welfare Ministry with a view to take care of the farming community’s needs as well as the personal problems faced by them. • The Prime Minister also announced to replace the current practice of interview-based selections for low-skilled government jobs with online merit based recruiting. • Under the Skill India and Digital India initiative, government will now work to provide package of incentives to manufacturing units for generating jobs.